The Hollywood Chamber of Commerce proudly honored film maker Ridley Scott with the 2,564th star on the Hollywood Walk of Fame today at 11:30 a.m. PST. The star in the category of Motion Pictures was dedicated at 6712 Hollywood Boulevard in front of the historic Egyptian Theatre and the The Pig & Whistle British Pub. The star for Mr. Scott is placed near the stars of other British entertainers such as Emma Thompson, Colin Firth, Helen Mirren and Malcom McDowell. “We are proud to dedicate a star to one of Hollywood’s most prolific directors who is responsible for so many of Hollywood’s iconic films. 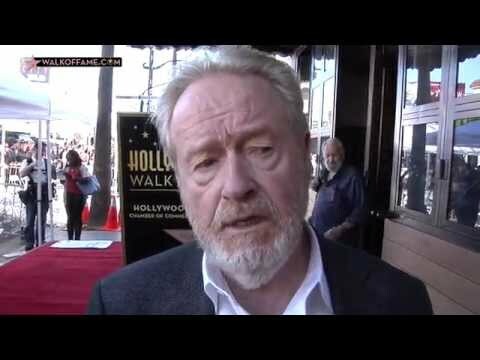 Ridley Scott’s work will long be a part of our film history,” stated Leron Gubler, Hollywood Chamber President/CEO. Helping emcee Leron Gubler to unveil the star were Kristen Wiig and Russell Crowe. Fans all over the world were able to watch the Walk of Fame star ceremony as it was live-streamed exclusively on www.walkoffame.com. Ridley Scott was born in South Shields, Northumberland, England and grew up in London, England, Cumbira, England, Wales, and Germany. He first studied graphic design and painting at the West Hartlepool College of Art, and then enrolled at London’s Royal Academy of Art where he completed his first short film. Graduating with honors, Scott decided to move to the United States to begin his spectacular career. Scott’s most recent 3D action-adventure “The Martian” starring Matt Damon was released by Twentieth Century Fox in October. Scott has garnered multiple award nominations over his illustrious career. Hehas been honored with Academy Award® nominations for Best Director for his work on “Black Hawk Down,” “Gladiator,” and “Thelma & Louise.” All three films earned him DGA Award nominations. Scott’s directorial credits also include “Exodus: Gods and Kings” in 2014 starring Christian Bale, “Prometheus” in 2012 starring Michael Fassbender, Noomi Rapace and Charlize Theron, and “The Counselor” in 2013 starring Michael Fassbender, Brad Pitt, Cameron Diaz, and Javier Bardem. In addition to his Academy Award® and DGA nominations, Scott earned a Golden Globe nomination for Best Director for “American Gangster,” starring Denzel Washington and Russell Crowe. He also received Golden Globe and BAFTA nominations for Best Director for his epic “Gladiator,” which won the Academy Award®, Golden Globe, and BAFTA awards for Best Picture. The multi-talented director also served as a producer on the true-life drama “American Gangster” receiving a BAFTA nomination for Best Film. Earlier in his career, Scott made his feature film directorial debut in 1977 with “The Duellists,” for which he won the Best First Film Award at the Cannes Film Festival. He followed with the blockbuster science-fiction thriller “Alien,” which catapulted Sigourney Weaver to stardom and launched a successful franchise. In 1982, Scott directed the landmark film “Blade Runner,” starring Harrison Ford. Considered a science-fiction classic, the futuristic thriller was added to the U.S. Library of Congress’ National Film Registry in 1993, and a Director’s Cut of “Blade Runner” was released to renewed acclaim in 1993 and in 2007. Scott’s other film directing credits include “Legend,” starring Tom Cruise; “Someone to Watch Over Me;” “Black Rain,” starring Michael Douglas and Andy Garcia; “1492: Conquest of Paradise;” “White Squall,” starring Jeff Bridges; “G.I. Jane,” starring Demi Moore and Viggo Mortensen; “Hannibal,” starring Anthony Hopkins and Julianne Moore; “Body of Lies,” starring Russell Crowe and Leonardo DiCaprio; “A Good Year,” starring Russell Crowe and Albert Finney; the epic “Kingdom of Heaven,” with Orlando Bloom and Jeremy Irons; “Matchstick Men,” starring Nicolas Cage and Sam Rockwell; and Scott’s hit version of the timeless tale of “Robin Hood,” starring Russell Crowe and Cate Blanchett. In 2003, Scott was awarded knighthood from the Order of the British Empire in recognition of his contributions to the arts. Scott is involved with the charity LEUKA which is dedicated to raising funds to support research and treatment of Leukemia at London’s Hammersmith Hospital. He is also actively involved with Heifer International, ASPCA, and donates his resources to the City of Hope and UNICEF.